The Mill has just completed visual effects on the new commercial Honda Accord for agency Wieden + Kennedy. Directed by Antoine Bardou-Jacquet at Partizan Midi Minuit, the 2 minute spot broke on April 6th. It will fill the entire ad break, during the coverage of the Brazilian Grand Prix. 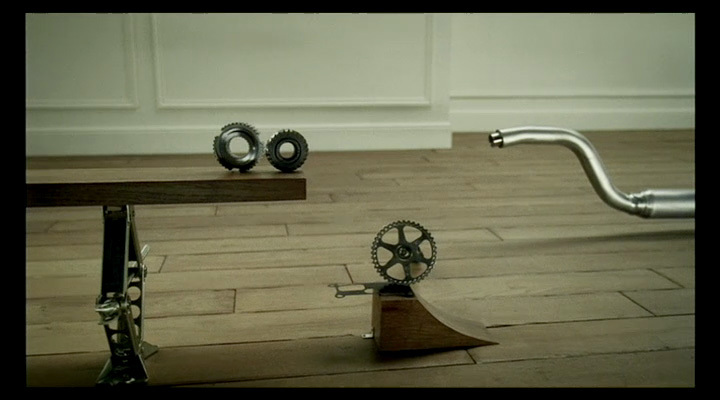 Titled Cog, the commercial is a based around a single cog that sets off a chain reaction across a selection of new Honda Accord components. The Mill's flame artist Barnsley went to the set in Paris, where director Bardou-Jacquet and his production team had been working for 5 months on the pre-production stages of the commercial. The aim was to achieve everything in camera, and as visual effects supervisor on the shoot, Barnsley advised the team on how to achieve effects such as the fine spray of water that lands a windscreen, triggering the walking wipers, in camera, using the correct lighting techniques.